Are you one of those crazy people who are still eating white bread? You may as well hook your arm up to an iv filled with bleach and processed sugar because that's basically what you're eating. In fact I have a hypothesis that even looking at it will cause you to bloat and see Green Peace pushing you back into the water this summer. If you read my column regularly you will know I advise against eating it, and anything white for that matter including white pasta and white rice. 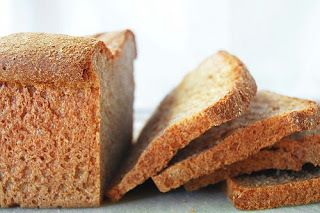 Maybe you are health conscious and buy whole wheat bread, believing you are doing your body a favor with all those slow digesting carbs and natural whole grains. 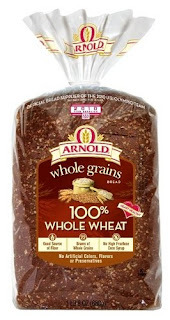 Well I'm here to tell you that just because it says "whole wheat" doesn't mean it is, and the variety you maybe purchasing at the grocery store may be nothing more than white bread in disguise laden with nasty chemicals and artificial ingredients. When you get to the bread isle there is an abundance of whole wheat varieties to choose from these days. You have honey wheat, multigrain, sprouted grains, rye, just to name a few, and we are bombarded with marketing slogans from food manufacturers stating things like "100% whole grain", "100% Natural" and "Made from Whole Wheat" leading us to believe we are eating something healthy. But we aren't always. Even though certain brands have these slogans, they are far from "Natural" and may still contain bleached white flour, sugar and salt, not to mention nasty fats and chemicals that are detrimental to your health and can make you fat. These ingredients are thrown into your "healthy" whole wheat bread by food manufactures, turning it into a cheap and profitable product for them, and a loaf of chemicals for you. Enriched Bleached Flour [wheat Flour, Malted Barley Flour, Niacin, Iron, Thiamin Mononitrate (vitamin B1), Riboflavin (vitamin B2), Folic Acid], Whole Grain Flour, Brown Rice Flour (rice Flour, Rice Bran)], Water, Whey, High Fructose Corn Syrup, Wheat Gluten, Sugar, Yeast Contains 2% or Less Of Each Of the Following: Vegetable Oil (soybean and or Cottonseed Oils), Calcium Sulfate, Salt, Dough Conditioners (may Contain One or More Of the Following: Mono- and Diglycerides, Ethoxylated Mono- and Diglycerides, Sodium Stearoyl Lactylate, Calcium Peroxide, Datem, Ascorbic Acid, Azodicarbonamide Enzymes), Guar Gum, Calcium Propionate (preservative), Distilled Vinegar, Butter (cream, Salt), Yeast Nutrients (monocalcium Phosphate, Calcium Sulfate, Ammonium Sulfate and or Calcium Carbonate), Corn Starch, Natural Flavor, Vitamin D3, Soy Lecithin, Soy Flour. Unbleached Enriched Wheat flour [Flour, Malted Barley Flour, Reduced Iron, Niacin, Thiamin Mononitrate (Vitamin B10, Riboflavin (Vitamin B2), Folic Acid], Water, Wheat Protein Isolate, Wheat Gluten, Oat Fiber, Polydextrose, Yeast, Soybean Oil, Cellulose Fiber, Salt, Natural Flavour, Wheat Bran, Whole Rolled Wheat Flakes, Rye, Corn Grits, Calcium Propionate (Preservative), Sunflower Seeds, Brown Rice, Steel Cut Oats, Triticale, Monoglycerides, Malt, Barley, Buckwheat Flour, Flaxseed, Millet, Soy Grits, Calcium Sulfate, Soy Lecithin, Sucralose, Azodicarbonmide. Sugar: The second ingredient in Arnold 100% Whole Wheat Bread is sugar. Not to mention it is also disguised in other ingredients in the products such as Raisin Juice Concentrate, Molasses, Dextrose and Maltodextrin. High Fructose Corn Syrup: If you see this ingredient in any of your foods you should avoid it at all costs. It is more concentrated than sugar and has been shown to cause diabetes and obesity, yet Sara Lee throw it into your "healthy" whole grain bread to sweeten the taste. Soybean Oil: The cheapest and nastiest oil out there, and if you turn over just about ay product you buy in the grocery store these days, you will see it on the ingredient list. Just like HFCS, Arnold used to include Partially Hydrogenated Soybean Oil, otherwise known as Trans Fat, in their products. But because of recent research declaring how bad it is for us, Arnold has mysteriously removed "Partially Hydrogenated" from before the ingredient. Maybe they are now just including the oil, maybe they are still chemically altering it, either way it's not good for you and if you see it on an ingredient list, don't buy it. Mono and Diglycerides: These are nasty fats, and if you remember my article the other day about chicken nuggets you will recall that these are used as emulsifiers to glue all the ingredients together and provide a pleasant texture. They are relatively new, and cheap, fats that are being used by food manufactures as a substitute to trans fats but are as equally bad for you. 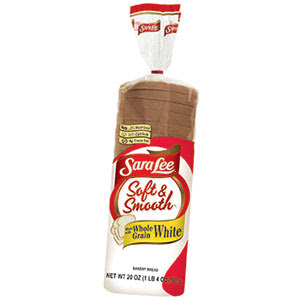 Enriched Bleached Flour: The first ingredient in Sara Lee's product and is code word for "White Flour". 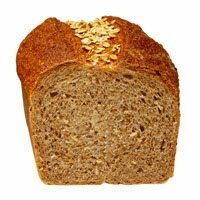 It is not whole wheat or whole grain and is essentially white beached flour that has had a few minerals thrown in to make you think it is good for you. It isn't. Calcium Peroxide: Is a chemical that can also be used as a fertilizer, but is most commonly used as a bleaching agent. Yummy. Azodicarbonamide or Azodicarbonamide Enzymes: Another additive that is used as bleaching and improving agent. It's use has been banned in various countries but still allowed by the FDA to be included in products here. DATEM: An acronym for more cheap fats used to give the product a chewy texture. Calcium Propionate: Is a preservative used to prevent mold and extend the shelf life of most breads. Studies have linked it with hyperactivity in children. Because it has no preservatives, you do have to store it in the refrigerator, but I don't have a problem with that. You can buy this at your local grocery store as well as Whole Foods and Trader Joes. I prefer the low sodium variety. - Look at the ingredient list: The first ingredient should be whole wheat or whole grain. If it isn't don't buy it. - Don't be fooled by "enriched" flour: This is simply bleached white flour with a few minerals thrown in there to make you think it's healthy. It's not. - Fiber: Each slice should have at least two or three grams of fiber per slice. Make sure you are checking the serving size on the back also because if the serving size is two slices and the fiber is two grams, than you are only getting one gram per slice which isn't beneficial. - Advertising: Beware false advertising! Because the FDA doesn't really put stringent rules on advertising on food products, the Whole Grains Council was established by an independent body to put their stamps of approval on certain products and to police food manufacturer's clever marketing. A product that says "Good Source of Whole Grains" must contain 8 - 16 grams of whole grains. Ones which state "Excellent Source of Whole Grains" must contain 16 grams or more. Being healthy is hard work, and its disheartening to know that there are food manufacturers out there who want to take our hard earned dollars and provide us with inferior products and label them as healthy when they aren't. But as a consumer, you have the power to avoid these products and the companies that produce them. Avoid buying them by reading the ingredient lists in everything you buy, and if you don't like what you see, go a step further and send them a letter and tell them what you think. In the meantime, find a bread and product that is healthy, and enjoy your slices knowing that you aren't consuming unhealthy chemicals or preservatives. Again, another great post! I, too, am a huge fan of Ezekiel bread. They even have a low-sodium version. And all are tasty...and despite needing to be refrigerated, it lasts longer than I expected. But I also buy a loaf, put half in the freezer and when I am down to my last couple of slices from the fridge, I pull the frozen half out. Great post, it's best to always buy fresh bread from a bakery because store bread is always full of stuff to make it last longer. I wonder if you can buy it in Australia? Do you know? Great post - another great bakery company is Alvarado Street - Available in stores in CA, and by web order elsewhere. Organic ingredients, made from sprouted wheat with no genetically modified ingredients - Even better, its a co-op that consistently gets recognized for how well they treat their employees/owners - Pretty tasty stuff! I would love to start eating healthier whole wheat bread, but I am allergic to Lentils so I can't eat the Ezekiel. I am not in a big city, so what is an alternative for me?